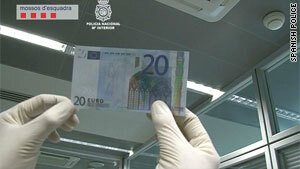 Spanish police image shoes counterfeit 20-euro banknote. Madrid, Spain (CNN) -- Police in Spain have arrested nine people suspected of bringing the equivalent to $40,000 a week (30,000 euros) in fake bills into Spain, authorities said Friday. Most of the nine suspects are of Spanish and Senegalese origin, the Spanish National Police said in a statement. Police experts say "this was one of the most active counterfeiting organizations operating over the last couple of years" in Spain, the statement said. The fake money was circulated in Spain and some African countries, it said.